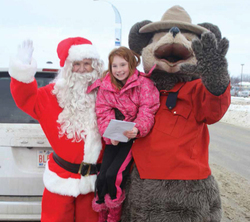 Amid a vast array of flashing lights on Highway 2A in front of the Super 8 Lodge in Wetaskiwin, vehicles were ushered through a Check Stop on December 6th, 2014. Only this time it was a Charity Check Stop where motorists were greeted by the police, sheriffs, emergency personnel and a multitude of volunteers with huge smiles encouraging them to make a donation to Victim Services or the Salvation Army. As vehicles approached the Check Stop, they were safely directed into a lane on Highway 2A where the drivers slowly and carefully proceeded through the ‘Charity Check Stop’. Once the drivers realized they are not being stopped for an infraction, they willingly made generous donations to the Victim Services and the Salvation Army Food Bank. Volunteers were on hand accepting cash donations, food donations and toys. It’s the annual fundraiser for Victims Services, the Salvation Army Food Bank and toys for Secret Santa. The Check Stop was also a friendly reminder to not drink and drive, but what made it different was that the real intent was not to catch drivers who had been drinking, but to issue a serious reminder to people not to drink and drive during the upcoming festive season. The money raised at the Check Stop is important for helping victims of crime and tragedy. With the festive season rapidly approaching, many people are struggling with added pressures. There are some who may not be able to supply their family with an adequate meal. Others are in the midst of personal problems such as abuse or a divorce. Some may have lost a family member or friend or were a part of an accident or tragedy. Although the Christmas holiday season is meant to be a happy and joyful time, this isn’t necessarily how everyone feels at this time of the year. Every year many people find added financial and time pressures, isolation or loss of family and friends, separation or divorce, and find things difficult to manage and seek assistance from Victim Services. The money raised during Charity Check Stop goes directly into helping these people get through the holiday season and throughout the year. The donations of food to the Salvation Army will provide meals for people in need and the donated toys bring many smiles and a great deal of joy to children through Secret Santa. And they did. The people of Wetaskiwin and region showed a great deal of caring for those in need. Car-after-car stopped and the drivers open-handedly dropped money into the collection cans, donated unwrapped gifts or donated food to the food bank. Victim Services and the Salvation Army thank you for your generous contribution. If you were unable to participate on December 6th but would still like to help, Victim Services will be accepting cash donations at their office in the RCMP building. The Salvation Army will accept food donations and toys for Secret Santa throughout the entire holiday season. For more information, to volunteer, or to make a donation to Victim Services phone (780) 312-7287 or visit Victim Services in the Wetaskiwin RCMP Detachment.